There will be no post this week or next - I hope you and yours have a fantastic holiday (or holidays). I know I will. I'll see you all early next year. I have seen the future of gaming, and have started moving into that future. I have acquired a 3D printer. It started a while ago, when I saw that DriveThruRPG now has a selection of 3D Printer Files. Huh, I thought to myself, Apparently that's popular enough to sustain itself. I wonder how long before I start seeing more of it. As time went by, I saw more and more things added to that selection. Miniatures. Dungeon walls/floors. A good variety of really clever things, actually. Then I learned that a friend from HS is very active in the 3D Printing scene. Huh, I thought to myself, I'll bet I could get Joel to help if I had questions. Time passed, and I kept an eye on this market. Then, on Black Friday, Amazon had the Monoprice Maker Select at a really low price. So I jumped on it, because this is apparently a good "starter" printer so people can figure out if/how much they like the process of printing. So I set the printer up and did what you do: I started printing. The SD card that was included had four "sample" things to print, and then I hit Thingiverse, where I spent a ton of time, looking at what I could do. I learned from the test prints, however, that this is not a fast hobby. One of the test prints is a little elephant figure. It's about two inches tall, and took about two hours to print. Following that, I grabbed Benchy. Benchy is a boat that people use to tweak and adjust their settings. It's a boat that serves as a diagnostic tool, which appeals to me. I really like that idea. This hobby is not yet ready for prime time. It's close, but there are so many configuration and adjustment tweaks necessary to get your prints just right that it's almost frustratingly slow. Because there are a ton of possible problems. Step 1: Adjust the temperature of my print bed to see if that fixed it. Step 2: Re-level my bed. Step 3: Change the thickness of my first layer. Step 4: Slow down the print head. Step 5: Speed up the print head. Step 6: Change the temperature of the extruder. Step 7: Change the extrusion rate. The process here is make a change, and print a test. Each test took two hours (although you can stop it early if you're still having issues). Even fixing the bed adhesion issue led to more tweaking, however, as other issues kept cropping up. I've had a couple of failed prints, too, where things just ... didn't print right. It's especially awful when those happen several hours into a long print. But I do think that better (and more user-friendly) home units are coming. I think the speed and stability of this technology will increase over time. There are already a handful of games available exclusively as 3D-printed files. Like this one, for example. While you could use cardboard chits and paper tiles with the provided rules that's not what the designer intended. I've joined the hobby at the tail end of the "early adopter" phase. I strongly believe that within the next three years, we'll have faster/cheaper/easier home units available. Within the next decade, they'll be ubiquitous. Not long ago. our housemate mentioned that he was looking for good "lunchtime" games that he can play with non-gamers. My first instinct was to grab No Thanks! - it's one of my favorite filler games. It takes about two minutes to learn to play and five minutes to get through. Here's a short list of good "lunchtime" games that you can play with non-gamers. No Thanks! - as above. Fast to learn, fast to play. 3-5 players. Age of War - I've found that calling this game "Strategy Yahtzee" gets the essentials across for most players. Players roll dice trying to get the correct dice combinations to claim cards from the table - including cards controlled by other players! If you can get all of the cards of a single set (all the red cards, all the blue cards, etc. ), you lock those cards so that opponents can't steal them and score bonus points. The game ends when all cards have been claimed. If it takes an hour, you're doing it wrong or rolling very poorly. 2-6 players. We Didn't Playtest This At All - This is the game that Fluxx should be. Fast. Random. Chaotic. And predictable in run time (short). The game lasts until only one player hasn't been eliminated - if it lasts six turns, it's an unusually long game. It also takes about a minute to learn to play. 2+ players (seriously, we've played it with 30 - but most players didn't get a turn ... ). There are also a number of expansions that kick the randomness up a few more notches without slowing the game way down. Rise of Augustus - Much like Age of War, I can just tell people, "It's strategy BINGO" and go from there. It's a bit more complex than some of the others on this list - call it "5-10 minutes of learning time." And be prepared for occasional questions during its 30 minute play time. 2-6 players. I realized in discussion on Google Plus about Perception rolls that these days, I'm really much more of a boardgamer than I am a roleplayer. And that shows through in my play and my thoughts about play. Lately, I've seen RPGs are being a resource management exercise. Players (PCs) have limited resources. Spell slots and hit points are the most obvious resources that most games feature, but there are others. Potions. Magic items. Abilities with "refresh" frequencies. Story Points. Time. The goal as a player is to maximize these resources. Save the Daily Powers for the Big Bad. Use the little stuff on the mooks. Work as a team. The goal as a GM is to make the resources feel thin, whether they are or not. "Okay, guys. Your goal is to reach the top of the hill and kill the Death Priest. He's standing over the entrance to a Goblin Warren, and every , there will be more Goblins to face once you reach him." And then give the PCs options. "There is a well-marked road that leads up the mountain, but it's almost certainly heavily patrolled and will almost certainly lead to combat encounters. And we all know how long those take. The party's ranger also sees a disused game trail that seems to head up the mountain. It will be slower going and will require skill checks for stealth and/or tracking. Failed rolls will slow you down or bring patrols in to investigate. Either way grants equivalent amounts of XP." Now this isn't a campaign. The GM didn't completely tip his hand, either: the GM didn't say, "When you reach the top, you'll learn that the Death Priest is the Mayor of Safeholm, and he's taken Sir Truehart's squire, Jacob the Awkward, as a hostage." These are things the PCs will learn when they reach the top of the hill. This is one session's encounter(s). Some games are more explicit than others about their resource management. Dungeons & Dragons, 4th Edition was quite explicit about it. 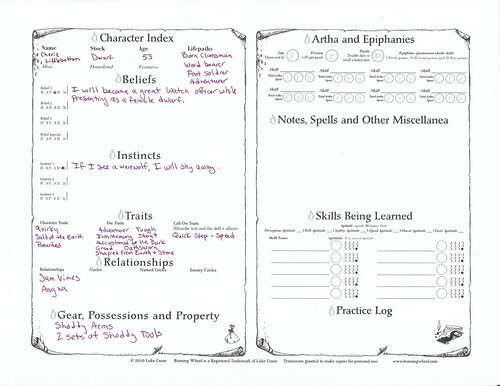 Players had "At-Will" abilities that they could use every round, "Encounter" abilities that they could use once per combat encounter, and "Daily" powers that they could use ... once per day. They also had points that they could accrue to spend for extra actions. GUMSHOE system games let players spend points on rolls - and those points don't refresh as much as you want them to. Other systems are more subtle. In Advanced Dungeons & Dragons, 2nd Edition, it's the list at the beginning. Spell slots and hit points. Some magic items had limited charges. Potions were single-use. Spellcasters who wanted to create magic items had to sacrifice XP to do so. Character advancement is a form of resource, too. Where you choose to spend your XP has a direct impact on what resources you have available. When you level up in 2E, sometimes you would gain skills (both Weapon Proficiencies and Non-Weapon Proficiencies). I wonder how many designers see the games in this way. The last few weeks, we've only had my wife and myself at Game Night. Or just Wade and Steph and myself. And it's good - don't get me wrong - there are a number of fantastic two-and-three-player games in my library. But it's still rough. I'd forgotten about this stage of starting a regular game group. The stage where sometimes it's just you. It's ... not easy. Honestly, it's sometimes downright discouraging. But I learned a long time ago to stick with it. The line from Field of Dreams, "If you build it, they will come," does apply here. It does work. Eventually, they will show up to play games. There comes a point where people who have been telling you, "I'll make it sometime," actually do make it. Sometimes they're sporadic. Sometimes they stick with it. Enough "sometimes," and they find that they are regulars. Boardgaming - for me - is a source of personal stability. If I don't play at least one game in a week, I'm not right for a bit. And I can do some of that gaming on Saturdays at Fantasium - unless something else is going on. Saturdays are when we play 13th Age and Legend of the Five Rings and sometimes some Dungeons and Dragons - but roleplaying doesn't give me that same focus. Thankfully, there are people around who are willing to play games with me - even if it's just a quick game of 7 Wonders: Duel (which is, by the way, fantastic). But there are so many games I want to play with more players. Street Kings is playable with three, but it looks like its sweet spot is 4-5. In fact, three is a weird number when it comes to board games, because there aren't a lot of really good games that handle three players well. Haggis. Blokus Trigon. It's given me renewed appreciation for the presence of a good game store - and sharpened the pain of losing a good one. I've started receiving more and more inquiries from publishers about sending me copies for reviews. I don't know if it's because of this blog or because of the Kicksnarker community over on Google Plus, or some other magic somewhere, but I'm getting sometimes several inquiries in a day. I love getting free things. Who doesn't? Financially, however, I'm in a good place. I can afford to buy most of the games I want to buy. And gaming is a luxury, so the ones I can't afford can wait. Because of this, I'm only accepting free copies of games (and other products) that I worked on. I am not currently accepting review copies of games. It means that the (too few) reviews that I post are biased only in favor of games that I thought were worth the money spent. And are biased against games that weren't worth the money spent. Those of you who are Seattle local, I'll gladly meet with you and play your prototype and give you feedback. I'll even extend that to folks who are visiting the area (or folks in areas that I'm visiting). So publishers? Thanks for the interest. It makes me feel important and influential and notable. But I'm not interested in receiving free copies in exchange for my review. So this upcoming Sunday marks the eleventh anniversary of this blog. Admittedly, the first post was, "Go away! Nothing to see here!" But it's still the first post here. In that time, I've had good posts and bad posts and a whole heapload of mediocre ones. By the numbers, I'm not big on the gaming blog scene. I'm not important or influential - but I also don't care about the numbers. Because of this blog, I've met some really awesome people from all corners of the globe because they've stopped by and read what I said and commented. I've met some of you in person, even, at GenCon or other events. It's been amazing. And I'm not stopping. I've carved out my little corner of the internet, and it's been awesome. Whether you're a regular reader or a first-time visitor, thank you for reading. A few years ago, a game came out called Mythic Battles. It was really good, and I liked it a lot. But it was cumbersome. You see, players would field armies against one another. As your units took damage, their stats would change. And yes, I know. It sounds like HeroClix, but it was very different. Very different. For one, Mythic Battles used tokens moving on the grid instead of figures. Each figure had a corresponding deck of stat cards. As you took damage, you would discard the top card of that deck. The dice mechanics were also different, and involved a degree of push-your-luck. There was a different deck of cards that you used to determine which units you could activate each turn, too. It wasn't just free choice. And the various units had different numbers of activation cards, too, so you might not be able to activate your immensely powerful (but slow-moving) units as often as you could activate your more nimble troops. Mythic Battles managed to survive long enough to spawn two expansions, which expanded the basic game, but I didn't see a lot of discussion of it on forums and blogs and the other communities I was a part of. It was a real shame. It more or less disappeared after the second expansion. I was disappointed by this, but it's part of the life cycle of games - games come and go and come and go. A few months ago, I got an e-mail from a friend asking if I'd be available to help on a new game. I figured Mythic Battles: Pantheon would be a similarly-themed game with a very similar name. What I hadn't expected was that the team behind the game never gave up on the game, and they wrote a new edition that is cleaner, clearer, faster-playing, and just all-around better. They replaced the damage decks with a sliding clip, and re-designed the cards and layout. Obvious disclaimer is obvious: I worked on this and will be getting a free copy. But I'm seriously considering backing for an additional copy. I'm a compulsive sleever these days. Most of my games are sleeved (and those that aren't make me twitchy). And it's because I know the life cycle of a game - they print an initial print run. If it sells out quickly, more are printed. If it sells out slowly, it may or may not get an additional run. If it doesn't sell out after a bit, it goes on clearance and will never be reprinted. I also know how much wear I put on my games. Deckbuilders especially, as it's "take two turns and reshuffle" for most games for a good long while. That puts a ton of wear on the cards. So I sleeve my cards as much as I can. I always try to sleeve out-of-print games, too. I spent a few hours recently sleeving The Great Khan Game, because that would be a crazy-difficult game to replace at a reasonable price. Some games also change slightly from print run to print run. Some of my Cutthroat Caverns cards are mismatched just enough that you can pick them out when unsleeved. Sleeving them fixed that right away (now if only someone would make a 90x90 sleeve that isn't a penny sleeve for my event cards ... ). I have one friend who - every time sleeves come up in discussion - expresses distaste for them. Every. Time. And I just don't understand the hate. Sure they make it a little bit more difficult to shuffle - but not much, and it gets easier with practice. It's not like we're stuck in the mid-nineties when card sleeves were not tournament legal for Magic: The Gathering and other collectible games. At the dawn of the Magic era, card sleeves existed for the storage and display of collectable [sic] cards. The idea that cards will retain a collectable [sic] value while also being played was revolutionary. Most early players refused to sleeve their cards. Sleeves available at the time fell into two categories: “penny” sleeves-- cheap, flimsy, and thin, and “top-loaders”-- two rigid plastic sheets bound together. In 1995 Ultra-PRO became the first company to sell card sleeves specifically designed for use during game play. So said Wizards of the Coast in 2004. Those 1995 sleeves by the way? Sucked. They were awful. A huge improvement over the other two types listed, but still bad. They're much better, now, than they were at the time. But now Ultra-PRO has much more competition, too. So what changed in the sleeving world? The market's focus shifted. The original penny sleeves were a loose fit that were a huge pain to shuffle. They were also wildly inconsistent - if you didn't buy them all at once, there was no guarantee that they'd be the same size (which effectively made for marked cards). This is because they were designed to hold baseball (and other sports) cards. Baseball cards are printed on a thin cardboard rather than a cardstock, so they sleeves needed to be a bit looser. And no-one in their right mind shuffled baseball cards, so the sleeves of the day didn't need to slide off of one another. Once Magic cards started to be worth actual money, however, people wanted to protect their investments. The sleeve companies saw that there was interest in sleeves you could use for play, and they responded, to everyone's benefit. Not long ago, a friend and I went to his FLGS to buy some sleeves. He'd recently purchased Legendary: Big Trouble in Little China, and wanted to protect it. With good reason - it's a fun game, and sleeves will extend that fun because - again - deckbuilder. So I checked this geeklist for the Legendary games (they all use the same size, as they're mostly cross-compatible), and the box for a number and told him confidently, "You need 400 of the Fantasy Flight Grey sleeves." Which matched my memory from sleeving Legendary Encounters: An Alien Deckbuilding Game. Side note: I really like the Fantasy Flight Supply line of sleeves for most sizes. They're high-quality, well-fitting, come in enough sizes to fit most of the games that are out there, and - most importantly - they are consistent from run to run. They don't make every size I'd like to sleeve, but they sure try. That geeklist, by the way, does have occasional errors, but it's correct much more often than it isn't. What's Coming (And Probably Out) That I'm Excited About? By the time you see this post, Essen will be over, and some of these may even be available. Important note: If you want to order these from your FLGS, it's possible that they'll have Matagot, Repos, Asterion, and Pearl listed under Asmodee, as those are all distributed in North America by Asmodee North America. Captain Sonar (Matagot) - A simultaneous-play game for up to eight players. I won't probably be able to get it to the table for a while, but I really can't wait for it. Some stores already have this one. Inis (Matagot) - The second Matagot game on the "Stuff I'm Excited About" list. Matagot has a history of making good games with lush art and simple rules. Cyclades and Kemet are favorites of mine that became favorites of those around me. Partly because my enthusiasm is infectious and partly because they are really good games. Innovation Deluxe (Asmadi) - Innovation was a favorite of mine a few years ago. We played and played and played. And then ... we stopped. I'm not sure why. Then Iello published an edition, and the edition I had stopped getting expansions. Then they did a Third Edition. Now there's a new version coming that includes the expansions. Sign me up! I want to play this one again! This year has so many expansions that have me excited. When talking about expansion, there are a handful of types: there are expansions that "fix" the base game, expansions that are more of the same, expansions that deepen play, and expansions that drastically alter the game. All four have their place - in an ideal world, there is no need for the first type, but this is (sadly) not an ideal world. In general, I prefer the third type - deeper, more interesting play is better, especially if I liked the base game. Hyperborea: Light & Shadow (Asterion) - I don't know much about this one, but Hyperborea was a favorite of my group for a good while (because it's a fantastic game). So I look forward to seeing how they expand the play. Cyclades: Monuments (Matagot) - As mentioned above: Cyclades is a real favorite of mine, and I've liked all of the expansions so far. Hades deepened play and fixed an issue with the base game, Titans drastically altered it. C3K was "more of the same." Much like Hyperborea: Light & Shadow, I don't know much about what's in this box. But I don't care. I want it, because I want to see where they go next. Room 25: Escape Room (Matagot) - Yes, another Matagot game/expansion. Because Room 25 is one of my favorite games. Period. Adding the Season Two expansion turned it from a fun game to a fantastic game. This adds a new puzzle mode that might get me to play this fully cooperative again. 7 Wonders Duel: Pantheons (Repos) - I was caught off-guard by how good 7 Wonders: Duel is. Even the rulebook didn't prepare me for how slick it is in play. Adding Gods to the mix looks like it shakes play up without destroying it. I don't know if this will be a "deepens play" or a "drastically changes play" expansion, even having read the rules. Deus: Egypt (Pearl Games) - I really enjoyed Deus. This expansion lets you swap Gods. So you can use a different pantheon. Before play, you decide which God you want to use for each color on the board, so it expands play options without crashing the "light tableau-builder" aspect that the base game had. So it's "more of the same," while still refreshing play. I'm down. Scythe: Invaders from Afar (Stonemaier) - Scythe is fantastic. This is a "more of the same" expansion that adds two new factions to the game. It means the map is a bit more crowded, and so there will (probably) be a bit more direct conflict. They also include power changes for two factions for balance reasons. Legendary Encounters: An Alien Deckbuilding Game Expansion (Upper Deck) - Likely to be somewhere between "more of the same" and "deepens play," like most deck-building game expansions. The original is a recent favorite of mine, despite its difficulty. I'm very much looking forward to this expansion. Because I haven't done a full Kickstarter update since ... January. Apparently. So I'm not probably going to touch on everything - just the standouts in terms of speed and/or quality. And it's crazy-long. Gattai Bushido: Fusion - This has about a week to go, and has hit its goal. The project creator successfully fulfilled his previous game (and it's good), and he's someone that I have (in the meantime) gotten to know personally. And he is a fantastic human being who deserves your money. That ... that can't be right. That's the only project I'm currently backing. I'm going to do this in reverse order of funding date, because that is how my spreadsheet is organized. 13th Age Coins and Tokens - Funded 5/27. Delivered 8/29. It's by the Campaign Coins folks, so the quality was never a question. Neither was their ability to deliver. I was still surprised at the speed. Polaris - this is a French-translated RPG that I've been excited about since I first encountered it about a decade ago. French games tend to have production values that are crazy-high, and this game is gorgeous. Well worth the money spent, and it delivered two full-size hardcover books and a smaller hardcover in three months. 7th Sea - The core book delivered in four months. Now there are about a billion stretch goal PDFs to follow - but I have faith that they'll make it. World Wide Wrestling: International Incident - I enjoyed the core book, and couldn't resist backing this one, either. Six months from funding to delivery. Street Kings - I'll write more about this once I've played it a bit more. But I know some of the folks behind the project, so backing was a no-brainer. As an interesting bonus, they included a link to this blog in their rulebook - not something I paid for or asked for or even mentioned. Burning Wheel Codex - I love The Burning Wheel. I really do. But the fact that the core book kept telling me to refer to long out-of-print books that are selling for stupid amounts of money was annoying (even though I had those books). This fixed that. I backed this, then the crazy wizard language they used in the project annoyed me enough that I un-backed. And then backed again. Six months funding-to-delivery. Mana Surge - a small, fairly light card game that a friend of mine wrote. I actually got to play a playtest version of this one a few times. A couple of playtest versions, actually. A fun game, and I'm glad I backed it. Epic - this game, from the Star Realms team is gathering dust on my shelf. I haven't even looked at the rulebook. I have a hunch it'll be good, but ... I don't know. Mare Nostrum: Empires - I have the original Mare Nostrum (and its expansion). But the new edition called to me. And it's really good. It's a drier trading-themed game with some combat, so it won't be to everyone's liking, though. Grimtooth's Traps - they did a collected/deluxe edition. It collects all of the originals and adds a few more. Grimtooth has always been good for a laugh. Esteren: Occultism - I think that Shadows of Esteren is one of the more thematic games out there. It's quite good, and all of its supporting material has been equally as good. Another of those French-translated games with crazy-good production values. Riders: A Game About Cheating Doomsday - I've written this before, and I'll say it again: Buy this game. Demon Hunters - I'm a fan of the films that this is based on. They're cheesy and low-budget and very funny. From the same team that did The Gamers. And I have the old Cortex-based version of this game. This new edition threw out that rule set and created its own - and it's fantastic. TimeWatch - this Gumshoe-system game funded in February of 2014 and delivered in August. It's ... good. There are some really neat things in here. But I don't know if it's "two-years-late" good. Of course, I'm still reading. Blue Rose was due in August. It looks like the PDFs are due this month. So late, but not enough to worry about. Short Order Heroes: Theme Packs - These were due in September of 2015. I have faith that I'll eventually get them, but I'd like more and more regular updates. I've REALLY loved the Short Order Heroes line of products so far. 13th Age in Glorantha - Due July 2015. Very infrequent updates. It's another where I know I'm eventually going to get it, but the constant delays are annoying. Tales From the Floating Vagabond - Due April 2014. Lee has had some serious medical issues - and he's given refunds to several folks who have asked. So I'm gonna tough this one out, but it's getting frustrating. Alas, Vegas - I knew when I backed this that it was going to be late. James Wallis has always been late with his delivery, even when he was Hogshead. But that was fine, because his lateness usually equated to high quality. But this is reaching the point of crazy. Fae Nightmares - I got the PDF for this in September of 2014. And it's still not available for general sale. And the print edition still has yet to appear. UPDATE: Between the time I wrote this entry and the time it published, Fae Nightmares went live on DTRPG. Not at its final price, yet, but still theoretically available. Seriously: Where is My Stuff? Synnibarr - I'm glad I'm not behind the scenes on this. I backed for three print books, and I have received one PDF. Twice, because at one point they deleted it (and killed it from folks' libraries) and re-issued instead of just updating the PDF. Far West - About a month ago, he promised to start releasing "beta" versions of the work "next week." I had to go to my Attorney General to get a partial refund on this. But I'm still in for $10. And if you ask Gareth, it'll be out "real soon now." You know: Just like he's said for the last five years. Powerchords - Goalposts moved. And moved. And moved. In May, we were told it was in editing. And was nearly done. But Phil does respond to e-mail. He has just stopped updating backers. A few months ago, I posted about box inserts. Since then, I've purchased (and assembled) a bunch of inserts for various games. I started with the Legendary Encounters insert (as I mentioned). Then I put together the 7 Wonders insert. Both of which I mentioned last time. Then I grabbed the Lords of Waterdeep insert which also holds the pieces from Scoundrels of Skullport (a fantastic game which I heartily recommend, BTW). The insert includes a center section that is - hands down - the most frustrating part of the entire thing. I spent nearly an hour on that central piece alone. Last time, I'd ordered a kit for working with foamcore. When it arrived, I grabbed some foamcore from the craft store near my office, and proceeded to just cut it up. I wasn't working too hard on making a specific insert - just on getting the fundamentals of knives and glue. One of my drill bits was defective. I thought it was blunt, and so I sent it back to the manufacturer for exchange (with - by the way - zero hassle). After the replacement had the exact same issue, I looked more closely and saw that the metal part had come free of the plastic, so turning the drill wasn't actually doing any cutting. That's an easy fix - I just used some Gorilla Glue and stuck it back in place. It meant no drilling with that bit for a day or two - but that's fine. I was able to work around it. After all - I was just familiarizing myself with the tools. Only without the glue to start with. Which - given the foam core I ended up with - is probably a good thing because I'd have needed to re-learn what I was doing. Because I ordered some of this foamcore. The craft store foamcore had a glossy finish. This is a matte finish - it's much more like normal paper covering the foam than the craft store stuff I'd picked up. The first insert I put together is one I never completed. I put together an insert for Mythic Battles, because the stock insert won't hold sleeved cards or the expansions. And I love this game. So I roughed out a basic insert (and like what I came up with). In a couple of weeks, I'm going to finalize what I have (using more precise measurements and glue). But last weekend, I broke out my glue and put together a couple of inserts. I started with Street Kings - a game I recently acquired that I need to write more about. I was dissatisfied with the stock insert because it didn't hold sleeved cards. And the cards that came with the game needed sleeves if they were going to have any hope of lasting. I'm very satisfied with what I wound up with. There's space under those player boards for the pieces. The cards are sleeved, and there is room on top for the board and the rulebooks. Now I just need to scan and print some things so I can stick 'em to the inside of the box so it looks nicer. And make it clearer which side holds the cars and which holds the upgrades (but that's a fairly minor thing, all things considered). I followed that up with and insert for Nations. The game is mostly 400 small cards in a huge box. Plus player boards and a central board. I got something functional together, but I'm not fully satisfied with what I have there. Maybe I'll revisit this one in the future when I'm more confident. Every insert I did gave me a few ideas that I could use in future inserts. Spacers. Notches. Groove cuts. Every insert I did increased my confidence a bit, too. I'm not a master - I'm never going to be a master - but since my goal is functional, I consider my work so far to be successful. I started work on an insert for Seasons (and its expansions), but it was getting late and I had to call it before I was done. We'll see how that turns out. But it's good to be working on something. It's a good feeling to be producing. Scythe is one of those games that has been very hotly anticipated. It raised 1.8 million dollars on Kickstarter, and has finally made it out to retail. And it's fantastic. So the goal of the game? The goal is to score points. You get points for stars placed, for territory control, and for hoarding resources (yes, really). And money. Because all of the points are really just money, so money that you've stockpiled is also points. The value of each of your scoring categories (other than money) depends on how popular you are. The game ends as soon as a player places their sixth star. You can earn stars for winning battles (no more than two can be earned like this), for upgrading your production, for getting all of your mechs onto the board, for getting all of your workers onto the board, for maxing your popularity, for maxing your military might, and for getting all of your buildings into play. I'm leaving out one or two star-earning methods, too. Each turn, you'll place your pawn in a space on one of your board. That space makes two actions available to you. You can take either or both. Each action has a cost (with a red background) and a benefit. To earn the benefit, you need to pay the cost. The top row of actions are pretty straightforward. Produce resources. Trade to earn goods. Move your pieces on the board. Gain military power. The bottom row is different on every board. The actions themselves are the same, but the costs and rewards differ, as does the top-row action to which they are paired. In the player board picture above, the yellow player can pay two lumber to build one of their buildings and earn one money (based on where the yellow pawn is). Each faction has its own special ability, and the mecha have different upgrades as well. Every time you build a mech, all of your mechs (and your hero) get an upgrade. This game is a difficult one to teach, because there really is a LOT going on that you need to hit people with. Movement, combat, production. Every player needs to learn the eight available actions - and that takes time. But in play? It's good. Really good. You end up with players all over the map, each pursuing specific resources and agendas in an attempt to be the one to end the game. Because the player who places that sixth star usually wins the game. But not always. There are a couple of caveats, though. Things about this game that are less-strong that may cause you to not like it. Because it's not a perfect game. It has flaws. Honestly, though, outside of Dungeon Twister, is any game perfect? Yes, you can move around and pick fights and move the other guys around on the board. But only two of those fights can win points for you (unless you're a specific faction). So there's not really any point to fighting combat after combat after combat. And the fact that attackers lose popularity for sending workers home means that a lot of combat genuinely isn't worth the effort. In the handful of games I've played, the game's ending was almost outta nowhere. We could look at the board and see that we were only a few turns from winning, but every time it's ended even earlier than we had expected it to. Each player gets a faction board and a player board. That player board makes some actions cheaper or more efficient than others, which makes it very clear what the best strategy for that player is going to be before the game even starts. None of these are, for me, deal-breaking flaws. Flaw #3 comes close, but it turns it into an optimization game. "Can I make my strategy work better enough that I can pull ahead of the other players?" Experienced players will have an advantage, here. And I suspect it can be an overwhelming one - but I haven't played any games with hugely disparate levels of experience, yet. The components are fantastic. Each faction has a distinctive mech and a distinctive hero. Each faction has differently-shaped workers. The art is insane. It's all by Jakub Rozalski, who has designed an entire world that is almost but not quite 1920's Eastern Europe. I've been stalling on posting this because I don't have photos to include (because my laptop is in the shop). Unfortunately, I got an ETA update on the laptop and it's still a few weeks out. A few weeks ago, I had the chance to play a (newish) sports game that was a bunch of fun. I'm a fan of Eric M. Lang's games. They're not always great, but they're nearly always fun. I'm also a sucker for sports-themed games. I own a ton of them - mostly football games, but I have a couple of soccer games and at least one baseball game. However, I especially like sports games that aren't designed to specifically emulate a real-world sport. I own Dreadball and Elfball and Blood Bowl and now KaosBall. And they all scratch very different itches. The first three are almost gridded miniatures games, with detailed rules and a huge variety of available options for players. Kaosball is much more a board game than a minis game, despite the ton of included figures. Like most sports-themed games, the goal of KaosBall is to score the most points before time runs out. In KaosBall, you score points by having certain players holding the ball and standing on scoring mounds at the start of your turn. There are four minor scoring mounds, which are scattered around the center of the field, which are worth small points (1-4, depending on which quarter of play you are in), and each player has one major scoring mound that is worth five points each. If one player falls too far behind, they are eliminated. Like most tabletop implementations of sports games, injuries (up to and including death) are a significant part of the game. The rules are pretty simple on your turn, you can activate one player or you can play a card. There are only two positions on each team, and each does things slightly differently. The Runner is your ideal ball-carrier. They are the only players who can steal the ball from opponents and they are the only players who can score points for you. The Bruiser is your team's hitter. They can tackle or attack opponents. They can carry the ball, but they can't score you any points. Each team has three stats and one special ability. The stats are "Steal" "Tackle" and "Attack." And the special abilities are widely varied between the dozen or so teams that are available. Each team's position players also have different numbers of life points. The goal is to get the ball to your runner and then protect that runner until the start of your next turn. If you start your turn with a runner holding the ball in a scoring space, you score points. As long as your runner can stay there, you continue to score points. At the end of the quarter, runners don't even need the ball to be able to score points. Sprint - move up to five spaces. If your sprinter is a Runner, you can attempt to steal the ball from an enemy at the end of your movement. Tackle - attempt to knock an opponent's figure down. Since you only have five pieces on the board at a time and your players can't stand up again until the end of the quarter, this is potentially huge. Attack - attempt to harm an opponent's player. Do enough damage to them, and they are killed. The cards that you can play have a variety of effects. You can throw fire down on the field, set up additional scoring spaces, drop walls on the field, or move more figures (among other things). Most of these cards also allow you to activate a figure in addition to the card's effect. There are actually three kinds of cards that you will play during the game. There are the cards I mentioned above (which are called tactics cards), there are cheat cards, and there are energy cards. Energy cards are how you resolve contests. They are numbered from +1 to +5. If I decide to tackle you, we each play a card and add our team's stat to that card. High number wins. The same system works for steals and attacks. If you play a card that matches a card you've already played, its value is zero instead of its printed value. In general, the game favors the active player. But not overwhelmingly so. At the end of each quarter, bonus points are scored, figures which were knocked down are able to stand back up, board effects are cleared, the ball is returned to the center space, and play continues. Players can also suffer penalties for playing too many cheat cards (the player with the most actually loses points from their score). And you can get bonuses for having killed your opponent's players. It's not a difficult game. There are a few other wrinkles in there for advanced players - Upgrades and Ringers. Upgrades are "always on" effects for your team. Some of them let you move faster or score points for successful attacks. Some of them are less-useful unless you're in league play. Like starting with more money, for example (don't get me wrong - it's good in one-off plays, too, but it's MUCH more useful in Leagues). Ringers are star players. They all have different special abilities. You can only field one ringer at a time (unless you have the Upgrade that lets you field more). They count as both Runners and Bruisers, so they can tackle and steal and attack. A random assortment of Upgrades and Ringers are available at the start of each game, and they are auctioned off at the start of play. So you can't build your strategy around having The Warrior on your team, because The Warrior might not even be there. And you don't want to spend all of your money on those, either, because you can buy off your cheat cards in play so that you don't get stuck with the penalty for being the biggest cheater at the table. The game plays two, three, or four players. It's best with two or four, however. I wouldn't recommend it with three. And the base game includes four teams, so you won't be instantly bored with the same matchup over and over and over and over. It being a Cool Mini or Not game, each team has a set of sculpted figures to go with it. And some of them are quite awesome. But they're also the source of the only real problem I have with the game: Cheesecake. There are no female figures who are not overly sexualized in the game. For some teams, it makes sense - the demon team, for example. But the Ninjas, for example, don't need to be cheesecake. The Amazons (who are included in the base game) are the least cheesecake team that includes female players. Honestly, the cheesecake is so bad on some of the teams (like the Felinia Hellcats) that I considered not getting the game. Sadly, this is not uncommon with CMoN games, either. I know there are people there who are working on it, but they've still got a ways to go. But if the cheesecake doesn't bug you, then this is very much a game worth looking into. As I write this, we still haven't had the first official Wednesday Game Night at the house, but we had a small impromptu Game Night. We kicked off with KaosBall, which is an Eric Lang design. Eric is one of those really nice guys that you hate because he's so talented. The only thing that all of his games seem to have in common is that they are Good, Fun, or Both (and they're usually Both). I need to write more about KaosBall at some future time, but it is Both. I just wish there wasn't so much cheesecake in the game. I'll be writing more about this game sometime soon. We followed that with a three-player game of Scythe. If you haven't played this one, it's another one that I need to spill some digital ink on. Fantastic game. The only real complaint I have with it is the minimal amount of player interaction - especially with fewer players. It also seems to end pretty abruptly. But neither of those is even close to being a deal-breaker for me. We followed Scythe with a game of Machi Koro. I won't play this game unless the expansions are in play, because the base game is ... not great. Boring and Predictable, for one. And there are a handful of broken strategies that can almost guarantee a win. The expansions fix these problems, and keep the game fresh. If you can track down the Deluxe Edition, it's worth it. And then we wrapped up with Quadropolis. It was only my second play, and the first time using the "expert" rules. I like this game, but it's not a ten for me. Probably a six-and-a-half or a seven. I'll play it, and occasionally I'll seek it out. But I don't think it's going to become a favorite any time soon. Although I've been wrong about that before. It's another game without a ton of player interaction, and the strategies are not readily apparent. Give me another three or four plays in the near future, and the strategy will almost certainly be clearer - but I expect I'll have trouble getting this to the table regularly. Two weeks ago, we had the Game Night Anniversary Potluck. It was the last Game Night held at Phoenix. This is a post that has been very hard for me to write. I've started and re-started several times, now. I've given up on editing it, so this is going to be a poorly-edited splat, and it'll probably run long. You Have Been Warned. The first experience I had with Phoenix was when I was stepping into a Waldenbooks. Across the way, there was this bright yellow store - but it contained games. I went in, bought some D&D stuff, chatted with the staff for a few, and headed out. I had no idea at the time that Phoenix was going to be my game store of choice for more than a decade. Brian was a fantastic store owner. He didn't ignore the business end, but he clearly had a passion for games. And, further, he worked hard to make sure that the store was clean and organized - down to pushing the chairs back in and straightening tables at the end of the night. Brian worked hard to make sure the store was a safe place - and that no-one was excluded. When it looked like cliques were starting to form at Game Night, he (subtly) broke them up and mixed the folk up again. The shop was both kid-friendly and kid-safe, and Brian was not shy about asking troublemakers to leave. Usually just for the night, but sometimes for longer. We weren't customers at Phoenix - we were family. All of us. Brian closed the store to move to California to be with his wife. None of us blame him (or her) for this. We all knew it was eventually coming. Within the first year or so of his being open, I was briefly unemployed. Brian hired me to run the shop for a few weekends here and there so he could go to weddings and the like. That Christmas, he handed me four sealed envelopes. "Choose two," he told me. And he shredded the other two right in front of me. "You are not allowed to open these until you're going to use them," he said. I don't know what was in the two destroyed envelopes, but one of them was a 30% discount. The other was a 100% discount. He hosted my bachelor party. As bachelor parties go, it was ridiculously tame - but he didn't know that going into it (although given how tame I am, he probably suspected as much). The last game I bought at Phoenix was Quadropolis. The last game I played at Phoenix was Black Fleet. I met Stephan Brissaud (now with Iello, then with both Days of Wonder and Asmodee) through Brian, and that led to my Demo Team work with Asmodee that lasted for a decade. So some of the best memories (and best friends) that I have either happened at Phoenix or because of Phoenix. Thank you, Brian, for a dozen of the best years of my life. I hope your future endeavors are as successful. You've set a high bar for yourself (and for the other local game stores) to meet. That's ... that's hard for me to deal with. The place had been a second home for me for more than a decade. Thank you, Brian, for making it such. Your store was always welcoming and safe. I hope all of your future endeavors achieve as much success as Phoenix did. Some folks at the last Game Night Anniversary Potluck were a bit confused, however. "Eric," I was asked, "How can this be the 14th Anniversary of Game Night when the store hasn't even been open 13 years, yet?" And the answer is simple: Game Night started in my apartment, before Phoenix Games existed. Back when Brian was still the regional manager for the Wizards of the Coast stores. And now that Phoenix is gone, Game Night is moving to my house. Well, other than those folks up North who have found other Game Nights ('Round the Table in Lynnwood and Zulu in Bothell are both about to experience an influx of really great people). Wednesday Evenings, my home is open to people I know who want to come play some board games. And people that my friends trust enough to invite. I have games. I have tables. I have chairs. I'm home by 7:30 - which, I realize, is a late start time on a weeknight. But Game Night has always been a late thing. Need an address? Let me know. I hope to see you here. So two weeks ago, I talked about one reason why game stores were struggling. Last week, I posted about why I feel they are a necessary thing. This week, I want to talk a bit about what publishers and manufacturers are doing to help game stores. Ironically, this post is going live just as the FLGS which I have supported for more than a dozen years is about to close its doors. And not because of financial problems, either. But I'll post a requiem for Phoenix another time. This is also going to be the shortest post in the series, because ... well ... you'll see. The Online vs. Brick-And-Mortar debate has been going on for a long time, and it's not limited just to boardgaming. My day job is at a wholesaler, and we carry several brands for which you need to be an "approved" retailer in order to buy the product from us. The manufacturers offer less warranty coverage if an item is purchased from a retailer who isn't on their list. Very few online retailers are on these lists. When I worked in car audio, the company for which I worked was very proud to be the only online authorized retailer for a couple of brands. To make that list, we needed to have knowledgeable staff (which was accomplished via in-house training) and had to be available certain hours (which is just a scheduling thing). We also needed to make certain pricing constraints. When you sell a product that you want to have perceived as being high-end, it does you no good to have it selling for bargain-basement prices. The first major tabletop game publisher to start working towards preserving the FLGS was Mayfair. A few years ago, they adjusted their retail pricing policy to cap discounts. Game stores who didn't meet the requirements of the policy would be cut off from buying Mayfair product. Distributors who kept selling to retailers on the "no sell" list would be at risk of being cut off, too. That was 2007. It caused a huge hue and cry from gamers, who suddenly saw their low-price resources suddenly drying up. There were cries of "price-fixing" and dozens of folks declared an intent to boycott Mayfair over it. But it meant that online game stores couldn't compete with the FLGS solely on price anymore. Earlier this year, Asmodee North America announced a similar plan and - again - it caused a huge hue and cry. Boycotts were declared (and I'll wager that many if not most of those boycotts have been broken by now). Privateer Press announced a "free rider" policy that they've put into place, too. Realistically, not much has changed. Deep discounters online continue to be deep discounters. There are fewer of them, as their sources slowly dry up, but you can still find cheap games all over the internet. Many publishers are also providing "organized play" kits. The Asmoplay kits, for example, include promos and goodies for a number of their games. Wizards of the Coast produces promo bundles for Friday Night Magic. Sometimes these bundles are free for supporting stores, sometimes they cost a bit. Tournaments are another form of organized play - and some publishers are now supporting tournaments for their games as well. On the RPG end, there's the Bits and Mortar program that many RPG publishers are driving. The summary of the program is simple: If you buy your RPG material from a local game store instead of via the internet, you can get free PDF versions of what you bought. I've taken crazy-advantage of this, because I buy a ton of RPG materials (and publishers who support this program are given priority for my purchases). Unfortunately, there's not much else that manufacturers can do to support the health of the FLGS model beyond that - mind you, they're always trying to come up with new methods. Realistically, the health of the FLGS model isn't in the hands of the manufacturers. They are doing what they can. The people who decide the future of the industry are the market. And by "the market," I mean, of course, "customers." You know: You and me. Where you spend your money now directly impacts where you will be able to spend it in the future. A good game store works hard to be part of the local gaming community. If your local game store just sells you games and that's the end of it, then they're probably not a good game store. They're just a game store, and you (honestly) might as well just buy online. I'd rather buy online than support a bad game store. You can usually tell a game store is good by looking for one key component: Tables. Game stores that don't have tables for demos (and other events) are very rarely good game stores. You see, tables are used for demos and events (including both open play and tournaments). And a game store that wants to be part of the community needs to host events. Phoenix Games has a schedule of events. Fantasium has a schedule of events. Card Kingdom has a schedule of events. Uncle's Games has a schedule of events. Gamma Ray Games has a schedule of events. Blue Highway Games has a schedule of events. The Game Matrix has a schedule of events. These, by the way, are all game stores where I have spent money in the last year. And they are all good game stores that are surprisingly close. So why are events and tournaments important? Magic: the Gathering (just to choose one common example) is still (to a large extent) driven by the tournament scene. The vast majority of those tournaments are hosted at local game stores. Because "I'm going to have a tournament in my basement, please send me prize support" doesn't really fly with most publishers. Or parents. If there was no tournament scene, then Magic: the Gathering would be a much smaller game than it is. Organized play (which includes tournaments) also increases the visibility of a successful game and encourages consumers to spend more money so they can get better at it. This helps manufacturers. Because if you happen to see people enjoying a game in public, you're more likely to pick that game up. I love Amazon. I love Funagain, but neither of them have ever hosted a tournament that I've been a part of. I suspect that organized play and tournaments (with the bonuses mentioned above) are the primary reason for manufacturers to love game stores. So a good FLGS hosts tournaments and events. What else sets an FLGS apart from an internet retailer? Knowledgeable staff. When I go to a good game store, I know that I can ask someone, "Is this game any good?" or "Can you tell me a bit about this one?" - and usually, I can get an answer. There are exceptions. The Game Matrix, for example, doesn't have a ton of board game-knowledgeable staff on hand, but their miniatures knowledge is fantastic. The best game stores have demo copies of many of their games, too. So when I ask, "Is this any good?" I can get an answer of "Let me show you!" This benefits manufacturers who make good games (and can punish manufacturers who make bad ones ... ). And it makes me more likely to return to that particular store. I love Amazon, but they've never taught me to play a game. I can ask Funagain a question, but I'm unlikely to get an instant answer. Instant gratification. When I see that game on the shelf that I want, I can take it home right now. I don't have to wait two days (or three days or a week) for the UPS truck to decide it's time to deliver my package to me. Local money. Some people pay close attention to where their money goes. "Buy local!" is a rallying cry for a lot of people. For me, Amazon is local, but I appreciate the sentiment. When you spend your money locally, it improves your local economy. When I spend money at Funagain, it boosts Oregon's economy. For the record: I have nothing against Oregon, but it's not Washington. Game stores are also the best way to find local gamers. Every time I have moved, the very first thing I did was scout the local game stores and check out their schedules. Because I want to be part of the local gaming community, too. I love my wife, but there are games that aren't very good with two players. And I'm not a solitaire gamer. These days, I can use BoardGameGeek or RPG.net or any number of other hobby sites (or social media sites) to find local gamers. But people online are often quite different than they are in person, and a good game store is a safe neutral place to meet (and sometimes get to know) people. Which reminds me: A good game store is a safe public place. If I had a child, I wouldn't want them going to game events in a stranger's home. Game stores as safe places expand the potential audience for a game - even if publishers were comfortable with events like Magic Tournament In Someone's Basement, parents (rightly) wouldn't be. By being a public place, game stores expand the possible audience for their tournaments. This is, by the way, not an exhaustive list of things that your FLGS does better than the online retailers. I'm sure there are others - but I don't want to force you to read a novel. ... and, here we are, a week and a half before you'll see this post (three weeks after I wrote it), and Phoenix Games has just announced that they're closing. Not because of competition from other game store (or the internet), but because Brian (rightfully) wants to be with his wife in California and can't find someone to take the store over. This is one of those posts that I've written and deleted and then written and deleted over and over and over again. And it's not an easy one, because there are good points to be made by all sides. And I'm probably going to wind up breaking it into multiple parts, because it's getting long and I'm nowhere near done saying what I want to say. You see, a few months ago someone stirred up the "The FLGS is an outdated model that has no place in modern gaming" argument again. It was probably in response to Asmodee North America's restrictive internet sales policy, which was designed (in part) to try to protect the FLGS distribution model. So what is the FLGS model? Why do people have such strong opinions about it? First of all, let me state that I am not unbiased here. I am a proponent of the FLGS model - and I live in a region where I'm blessed with a number of them to choose from. Let me also state that I am not an economist. I've done a ton of reading and research over the years, and I currently work for a distributor (one not in the gaming industry). And I'm also going to be speaking in generalities. There are always going to be stores and wholesalers who are exceptions to what I'm saying (Docking Bay 93, for example, is more-or-less built out of a warehouse). Let's start at the very basic level, here: FLGS stands for "Friendly Local Game Store." This is a specialty retailer who sells hobby games. Sometimes it's a dedicated game store, sometimes it's a comic or hobby craft shop that happens to also sell games. There are lots of things that differentiates a good game store from just another game store, and I'm going to go over that in a few posts. The manufacturer would make the product and then sell it to a distributor. Distributors would then mark the price up a bit and sell it to a retailer. That retailer would then mark the price up a bit and sell it to customers. Very few manufacturers went direct with retailers - and, when they did, it was often some sort of exclusive deal. Like (for example) Craftsman Tools, which were only available at Sears. This model worked very well in the pre-computer days. Manufacturers liked it because they only had to keep track of a small handful of addresses to ship to and bill. Retailers liked it because they only needed to keep track of a small handful of distributors to get all of their stuff. Distributors liked it because they made money. Retailers didn't go direct because manufacturers didn't like the additional paperwork (and neither did many retailers). Go to one store for Asmodee products, another store for Hasbro products, another store for your Cool Mini or Not games, another for your Playdek games, another for your Czech Games Editions, and another for Pelgrane Press, and yet another for Cubicle 7? Go to one store to buy all of the above in one place, but pay a bit more per product? In example 1, you're going to be spending more because of the gas and time (and/or shipping costs). Not only that, but you'll need to keep track of a dozen different stores and their invoicing and billing cycles and the like. In example 2, you pay more per product, but you don't waste time driving around (or paying shipping) for every little thing. And - in business - time is money. Overall, the second example above does save money. Example 2 is one way in which distributors work - and why they work. Small business owners already put up with a ton of paperwork and - sadly - not all of them are well-organized enough to actually make it work. And they need to keep track more carefully for tax purposes than you do when buying games to play. Some distributors give discounts based on volume, too. So if you buy a ton of stuff from them, you pay less per item. It's also representative of how retail works - and explains the appeal of "superstores" like Target and Wal*Mart. They're descendants of the old-fashioned General Store model. Now fast forward to now. Computers have made things easier, so it's less work for manufacturers to have more and more and more accounts. It's easier for retailers to also have more accounts at more places for a wider diversity of products. Some manufacturers even sell to the general public, now. This is not a bad thing. I want to make that very clear. But suddenly the internet appeared. Physical stores have overhead. The costs of doing business. Rent. Taxes. Licenses and permits. Utilities. Maintaining their computers and software. Paying their staff. Black Diamond Games in California has a fantastic breakdown of where money spent in their store goes. I recommend their blog in general, too. Internet retailers also have overhead, but several categories are much lower (and a few can be higher). The notably lower categories for internet retailers include the biggest bit of overhead that stores face - rent. Especially when calculated per square foot. Internet retailers can run out of warehouses in the middle of nowhere. They don't rely on foot traffic to keep them afloat. Because of this, their rent per square foot is significantly lower than the rent paid by a game store. But internet retailers also tend to have a lot more square footage. Internet retailers also buy in larger quantities than small storefronts do. They can afford to store it (they have the room), so why not? It means that they can buy from distributors at a greater discount. So where a brick-and-mortar guy pays $55 for the game, the internet guy pays $50 (or less). The internet retailer is already making $5 more profit for the same game. If he's someone "known," he can expect to sell more games than the brick-and-mortar guy (with some exceptions), so the stuff turns over more quickly. Internet retailers also aren't limited in their audience. I don't spend a lot of money at Canton Games in Baltimore, MD. Don't get me wrong - it's a fantastic game store, and I very much enjoyed visiting a few years ago. But I can't spend money there because I'm in Seattle, Washington. I'm three thousand miles away. But I can buy from Funagain. I can buy from Amazon. And both of them are regularly cheaper than my FLGS, even when I factor shipping into the picture. Suddenly, I can pay my FLGS $100 for Hyperborea, or I can pay considerably less than that online. That means that the FLGS is suddenly selling less product with higher overhead. Some game stores are offering discounts to regular customers or coming up with loyalty plans or otherwise working to reduce the impact of selling less product - but they still can't really reach the low prices you'll find online. From a strictly monetary perspective, the FLGS model is obsolete. But then so is most retail. There's a reason that shopping malls are slowly dying off in many areas. So why are manufacturers working to support the FLGS model? Why is it important? What's worthwhile about it? I'll go over that next time. It's been a while, so if you don't know what this "Character Generation Project" thing is, follow this link. Steph wrote about her usual process here. If you want to see past posts in the project, there is a link in the sidebar to the right. The questions are in bold text, Steph's answers are in plain text. My comments are italicized. 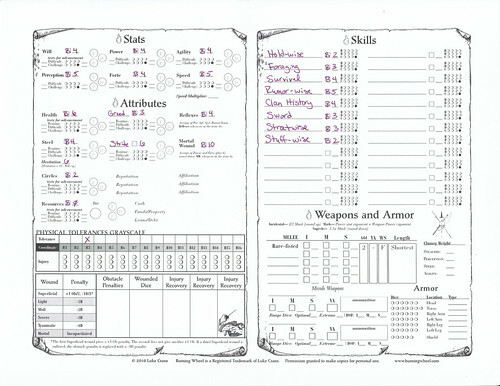 It's worth noting that there are two versions of the character sheet - one version is for short campaigns of a dozen or fewer sessions, the other is for longer games. We used the shorter version (in part because it's fewer pages and is, therefore, less intimidating for people new to the system). This is one of those games that I really like. On paper. It's a game I desperately want to try to play sometime, however. I'll write more about it further in. Note the empty "second" page, here? she should have 1 Fate and 1 Persona. When Steph told me this, I figured she was trying to make a character similar to Cheery Littlebottom. I hadn't realized that her goal was to exactly recreate Cheery. A note on spelling, here: Sometimes it's Cheery, sometimes it's Cheri, and sometimes it's Cherie in Pratchett's writing. So the fact that Steph spells it one way and I spell it another is not an error on either of our parts. She was initially Cheery, but once she decided that presenting as female was not shameful, it changed. It may also bear noting that even Female Dwarves on the Disc are bearded, so the "Bearded" trait isn't even a little unusual for Dwarves. The setting seemed pretty divorced from the system, except for the life paths. This is a game that is very much like Dungeons & Dragons in that respect - while it doesn't include a setting, it is built around a set of specific setting conceits about how (for example) Elves and Dwarves behave (and interact with one another). mechanical stuff appears - stats, skills, etc. Any time a character generation system is diceless, the player has more control over the outcome. This game has no random elements during character generation, and so Steph had complete control over her outcome - barring her wanting something crazy like having her Dwarf character take an Elf lifepath or something similar. As a GM, I might have allowed her to take the (human) City Guard path, had she asked - but she found paths that did what she needed without needing to ask for GM intervention. I felt like I had enough control to make the character happen. This is both a strength and a weakness of lifepath-based character generation systems - sometimes, the path you want to take is supported by the system. Sometimes, you need to "jump the tracks" to get to the path you want. Burning Wheel has a way to "jump the tracks," but Steph didn't need to use it - her desired lifepaths flowed from one to the next seamlessly, and seem to have done what she needed them to do. The layout of the book and the helpful worksheet didn’t match up, which led to a lot of flipping back and forth. The traits and skills weren’t spelled out particularly well, and took more time than I expected to figure out how to spend my points appropriately. The "helpful worksheet" is the character burning worksheet from burningwheel.org's wiki. Its steps six through eight are different from the steps six through eight in the book. They do the same thing, but in a different order. But there weren't any huge obstacles, either, which is good. Especially as this is the crunchiest system we've done so far. Having the worksheet line up with the sections of the book; having a clear explanation of what needs to be spent for each skill. It doesn't help that the Burning Wheel guys use the most pretentious language throughout the book. It's - honestly - a bit off-putting. Did anything leap out at you as obviously broken or unbalanced? . It’s a more character-driven game, as I understand it, and I am always looking for something of that nature. Beliefs and Goals and Instincts having actual mechanical effect goes a long way towards pushing this game in that "character-driven" direction. In theory, any game can be character-driven, but very few games actually push character mechanically. Looking at Steph's Beliefs, I think that "Presenting as Female should not be shameful" is one belief. "I will become a great Watch officer" is another. If I were running this as a game, I might ask her to split this into two separate Beliefs. This took longer than I expected, and seemed more complex that I had anticipated. This is the "crunchiest" game we've made a character for so far. In general, I tend to prefer games with "lighter" character generation - but a bit of crunch never did harm to anyone. Worth noting: If I were to run a Burning Wheel campaign, I'd force her to make a new character, because I want to see her character, not Terry Pratchett's character. Although she could probably change the relationships and make this work. I don't know if I've said this before, but I consider this to be the most important question that Steph answers on the questionnaire. Character Generation should always be one more hook into a game - if CharGen turns you off of a game, then it doesn't matter how good the game is or how smooth it is in play, you'll have lost a player before you even start. And this game requires a fair amount of player buy-in right off the bat. I think the life path mechanics is a great way to open up the character generation process, and the beliefs and instincts are a solid bit of character development in-game as well. By Star Trek, she means FASA's old eighties version of the game, not Last Unicorn's or Decipher's versions - or even Prime Directive - although we do own all of the above (and I may ask her to attempt to re-create the same character in one or more, just to see what happens).